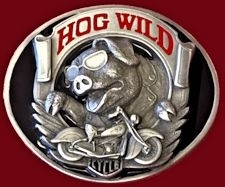 This finely sculpted and hand enameled hog wild belt buckle contains exceptional 3D detailing. The words 'Hog Wild' are hand enameled with red enamel. There is a pig wearing sunglasses and a motorcycle with wings. These unique pig buckle designs often become collector's items and are unequaled with the best in American craftsmanship. This biker belt buckle is approximately 3 1/2" long and 2 3/4" tall at the widest part. It fits up to a 1 3/4" wide belt. This product was added to our catalog on 04/29/2018.